We're out at discovery lab right now! If you want to keeps tabs on what we're doing I will try to blog about every day or so over here at the church planty blog. Discovery Lab is designed to provide you both these tools. It a behavioral assessment to help you, as a church planter candidate, gather information about yourself to see more clearly where you might best serve the kingdom with your abilities and skills. The final outcome of Discovery Lab is a Church Planter Profile summarizing your character traits, ministry skills and readiness for church planting. I'm nervous because this is a major step in our journey toward church planting. There is a lot on the line here. We've been dreaming about this for years now. We moved across the country for school. We moved into the neighborhood where we feel God has called us to plant a church. Now in just a few days we will submit our dreams and plans to the oversight and direction of Kairos. I would really appreciate your prayers for us. 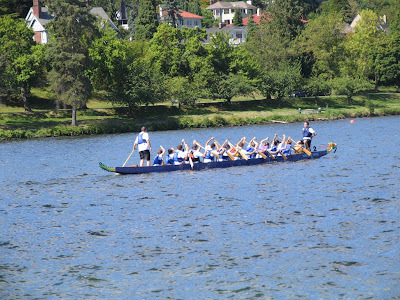 This last weekend we had our final dragon boat race of the season. 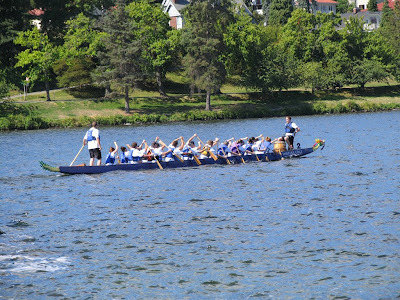 In the picture you can see me as the tiller (the guy who steers the boat). 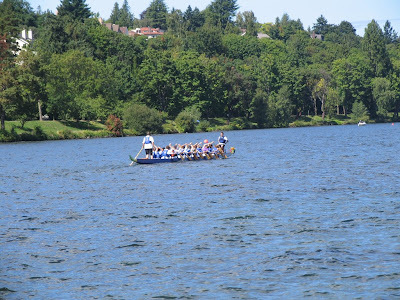 Our team traveled to Seattle for the weekend, but we have been losing more and more people over the course of the summer so we had to join up with half a team from Seattle in order to fill a boat. 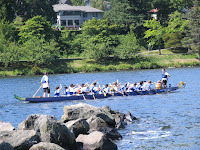 The first time we had paddled together was our first race (we came in 2nd out of three). Things weren't perfect, but I could definitely feel the power on the boat. The second race we didn't improve much (3rd out of 4). By the time we were getting to our third heat of the day the lake was getting choppy and we had lost a paddler who had to leave early. We tried to compensate, but during the race something went wrong and the boat turned sharply to the left (remember it's my job to steer us). I had to stop us and turn us the right direction in order to finish - we were 30 seconds off the pace. I was upset with myself for not doing my job and costing us precious time in the race. The next day we arrived to very choppy water and a moderately strong wind. The race coordinators were all cautioning us as to how we needed to avoid the wind and to keep the boat balanced so we would not capsize. We got out on the water and got ourselves aligned for the race. The start was good, but again about mid-way through the race the boat veered sharply to the left. I had to stop us to prevent us hitting another boat and then get us going the right direction again. I was furious. Livid. How could I have made the same mistake twice?! 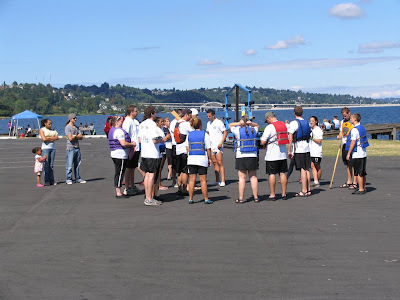 I directed the paddlers to dock the boat and I immediately went to the race coordinators and asked if I could be replaced as the tiller. I explained that I keep making the same mistake and we don't have time for me to learn during the races. They were great and found us another tiller and I replaced our missing paddler on the boat. I couldn't immediately join my team because I was still very upset with myself. So, I found a quiet place and sat alone for a bit. That's when Dr. Huffard would have been proud of me - I immediately thought of a leadership principle that I had learned from my experience ( I took a class in leadership from Dr. Huffard and he wanted us to develop the skill of finding leadership principles in our experiences). A good leader will not allow their personal shortcomings to bring down the team which they lead. There just wasn't enough time for me to work on my own skills. The only time we had on the boats was time to race. I found out after the fact that there are significant difference in the boat structure versus what we are used to and having a team that has never paddled together did not make my job easier. I'm sure that if we had some time to practice with that team in those boats on that lake that I could have done a much better job. However, without that opportunity the best thing that I could do as a leader is to defer to someone with more experience to step in and take over for the short term. Have you ever been in this type of situation? 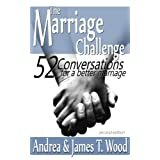 Have you ever felt like there was nothing you could do to fix your mistakes? Sometimes, as a leader, there is nothing you can do in the moment; it's time to step aside and let someone else help. You can fix your mistakes later, when the work of the team isn't on the line. With CERN's Large Hadron Collider finally coming online, watercoolers around the world will soon be abuzz with talk of Higgs bosons, gluons, and other mind-blowing subatomic thingies. How to keep track of all that quantum fluff? It's easier than you think. 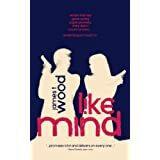 Fans of shows like Survivor , American Idol , Top Chef , or America's Next Top Model already have the tools they need to wrap their heads around the fundamental bits in our universe. Turns out, if you understand reality TV, you can understand reality. Gluons are the Donald Trumps, Tyra Bankses, and Mark Burnetts of the subatomic world. Just as these executive producers (often doubling as onscreen overlords) dictate the rules and force contestants into tightly knit alliances for survival, gluons wield what's called the strong nuclear force, impelling quarks to clump together into the neutrons and protons of an atom's nucleus. There are six types of quark, arbitrarily named up, down, top, bottom, charm, and strange. Think of them as the personality types that make every reality show go: the gay one, the jock, the bumpkin, the minority, the brainiac, and the drunken train-wreck girl. They always form alliances (called hadrons), and, well, they work best in threesomes. Hot! We know the Higgs boson particle must exist — it's why matter has mass. But physicists have been unable to observe it. Have folks like Kelly Clarkson found the Higgs boson of reality TV — enduring stardom? Let's hope so. Because like the real Higgs boson, if lasting fame isn't possible, the whole Theory of Everything will need to be reconsidered. Photons carry electromagnetism, which bonds electrons to nuclei, and generally keep the excitement level up. Zooming around at the speed of light, these energetic particles hold the whole shebang together — just like Ryan Seacrest, Idol's charismatic liaison between judges, contestants, and viewers. Many shows have a panel of regulars that sit on the sidelines and observe. This is the lepton family. Some, like electrons, matter (Tom Colicchio).Some, like muons, are overblown and unstable (Simon Cowell). Others, like neutrinos, pass through without ever making contact with reality (Paula Abdul). W and Z bosons carry the weak nuclear force, which causes other particles to decay. These are like the parents, ex-lovers, and others who pop into a show merely to wreak havoc. Think Flavor of Love's Tiffany Pollard, aka New York, who returned in season two to terrorize anew.